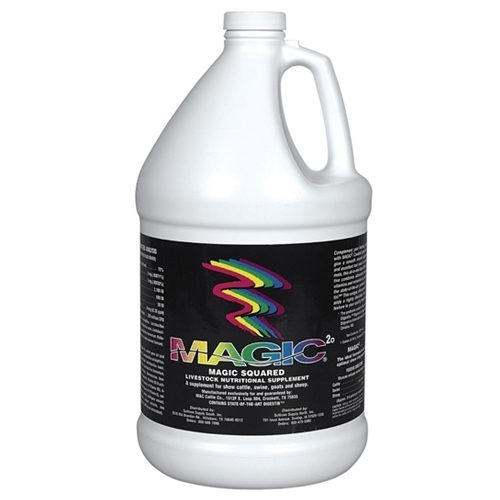 Magic Squared Liquid Livestock Supplement [MAGIC] : Highland Livestock Supply, Ltd, Products for all of your show animals! Gallon - Combines proteins, concentrated mineral-vitamins, and Digestin in a high fat (75%) liquid. Magic helps to develop a healthy hair coat, increased bone growth, muscle tone, body fat, and feed efficiency. Feed cattle 4-6 fluid oz. per day, lambs 1-2 oz. per day, and pigs 3-5 oz. per day.